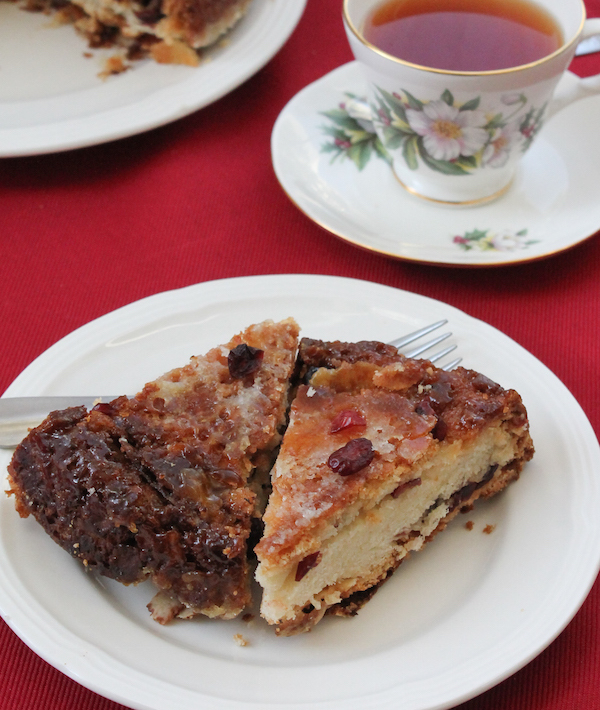 Traditionally, this British afternoon teacake is made with raisins, sultanas and/or currants. 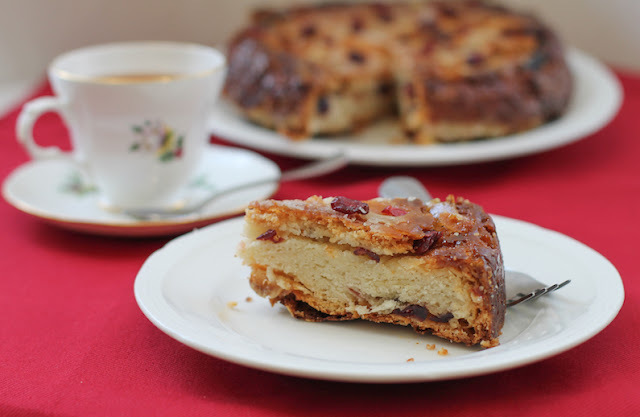 My cranberry lardy cake is studded with dried cranberries, but fear not, it is amply filled with the requisite lard and sugar, for a properly respectable British teatime treat. 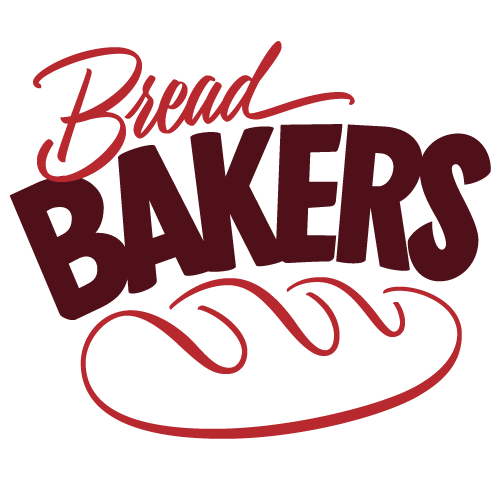 This month my Bread Bakers are baking up yeast cakes, a subject that required some research on my part. I came up with a list of possibilities, mostly from old English recipes, to be honest. Before the days of chemical rising agents, like baking powder, the most reliable ways to get a cake to rise was either to add eggs or yeast. 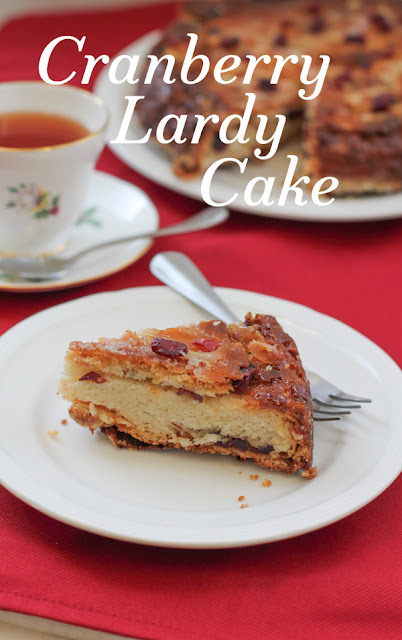 Lardy cake caught my fancy because, as previously mentioned here, I have a weakness for caramel. When baked up properly - that is with plenty of lard and sugar! - the bottom turns into a crunchy caramel. As the cake is flipped for serving, you end up with a gorgeous caramel top. Who can resist that? 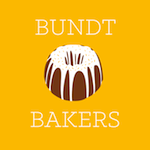 My recipe below is a combination of a couple I found on the internet from The Happy Foodie and Hobb House Bakery. 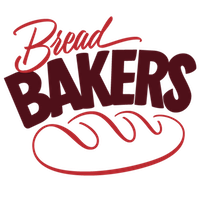 Check out this YouTube video to watch one of the Baker Brothers make their version. That first link is actually the one that gave me the idea to add cranberries. The recipe called for crimson grapes, which I’d never heard of. Cranberries, on the other hand, I keep always on hand. Mix the yeast into the warm water with one teaspoon of the sugar. Set aside. 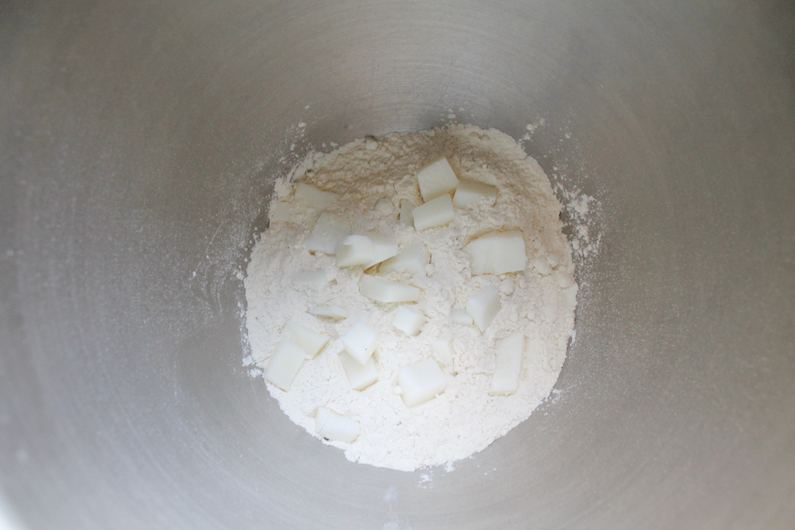 Measure the flour, salt and lard into a big bowl and use a pastry cutter to cut the lard into the flour. 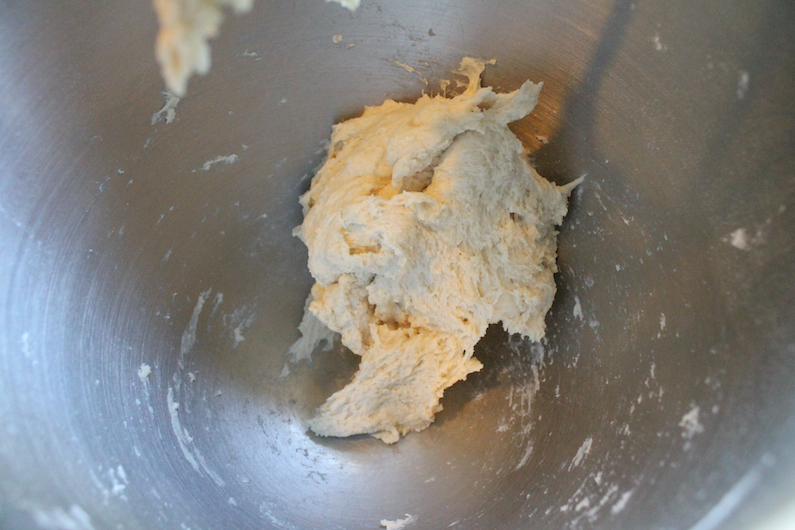 When the yeast mixture has started to bubble up, pour it into the flour bowl and mix all the ingredients together. If you are using an electric mixer with a bread hook, knead the dough for 10 minutes. If not, sprinkle a little flour onto a clean work surface and tip the dough out of the bowl onto it. 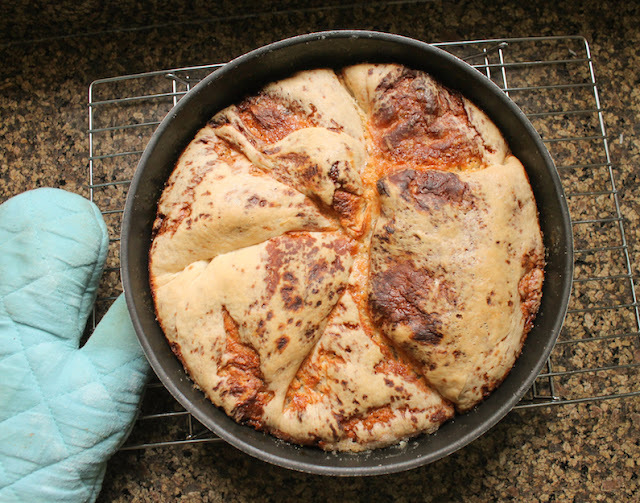 Knead the dough for 15 minutes. 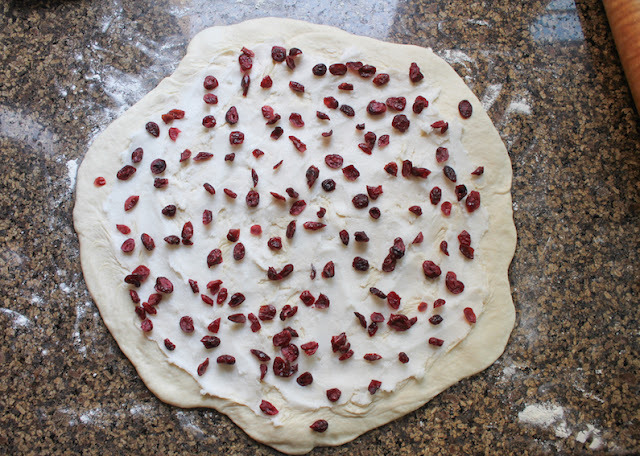 Once you have a smooth and elastic dough, pop it back into the bowl and cover it with cling film. 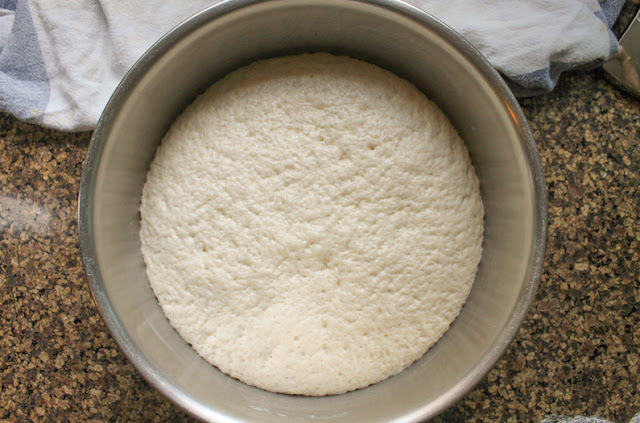 Leave the bowl in a warm place for the dough to rise to twice its size or for 1 hour, whichever comes first. 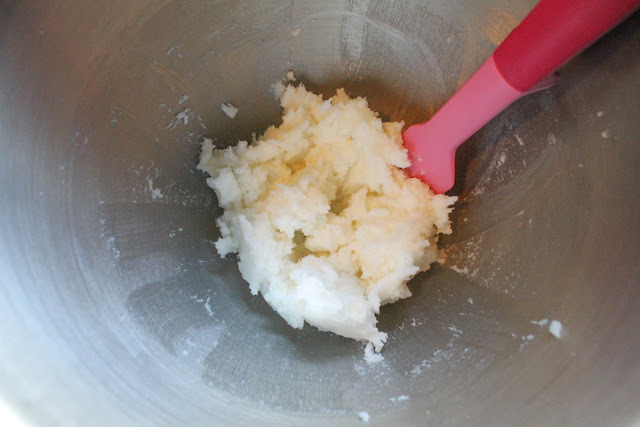 Meanwhile make the lard and sugar mix by creaming them together in a mixer or with a wooden spoon. 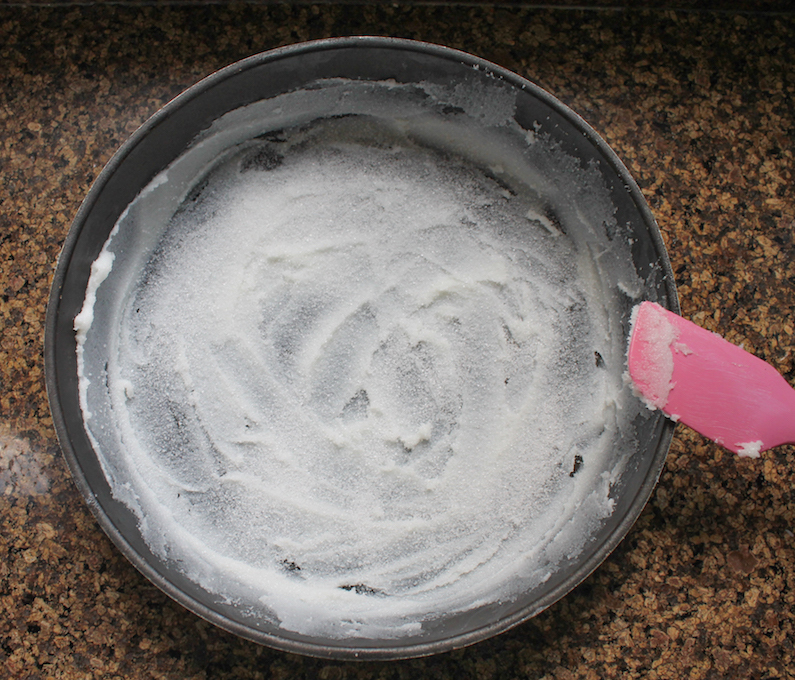 Prepare your 8 in or 20cm round nonstick baking pan by coating it with 1/3 cup or 87g of the lard sugar mixture. Use a rubber spatula to spread it over the bottom and up the sides. 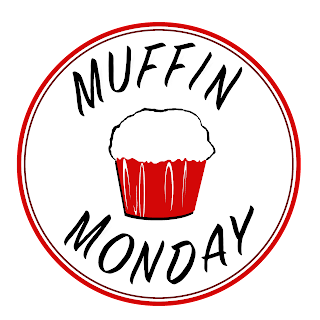 Sprinkle an extra tablespoon of sugar over the bottom. 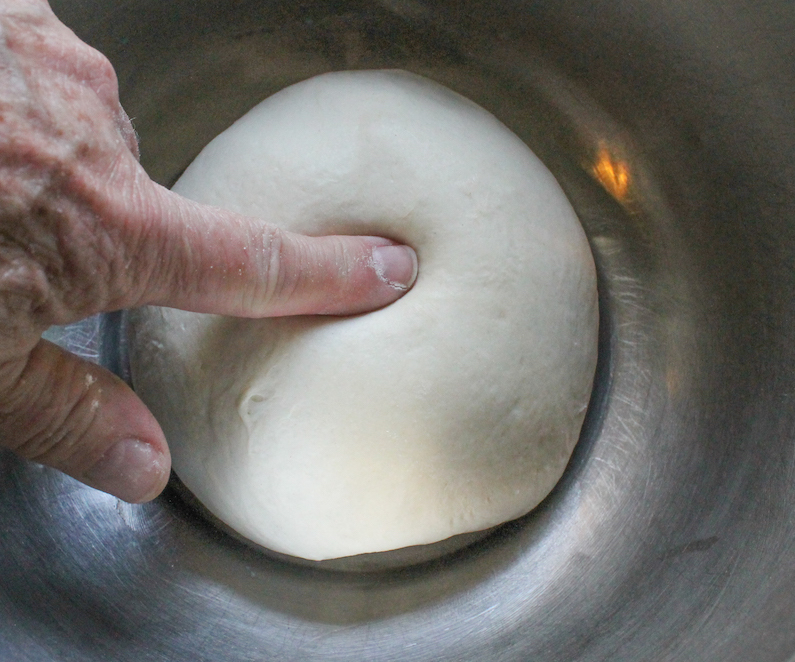 When it’s risen, gently press the air out of the dough and form it into a ball. Pop it on a well-floured work surface and use a rolling pin to roll it into a circle about 15 in or 38cm across. Divide the remaining lard/sugar paste in half. 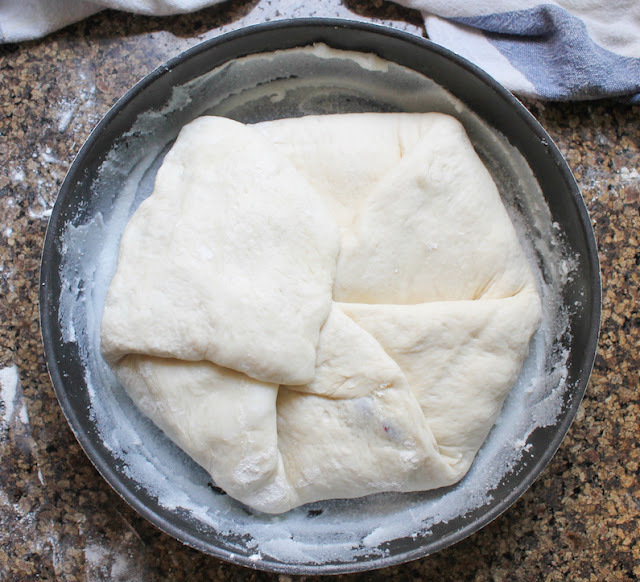 Use a spoon to distribute one half over the dough circle. 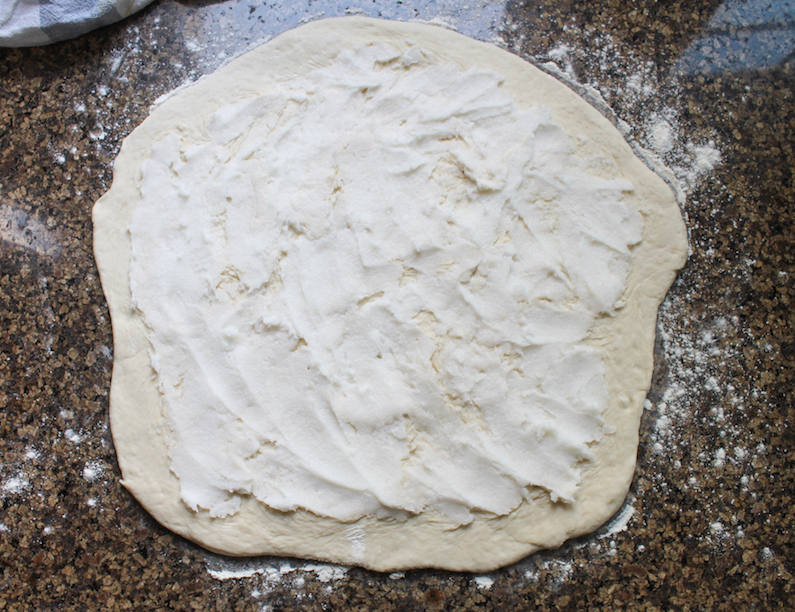 Use a rubber spatula to spread the paste over the dough, leaving a small margin of dough around the sides uncovered. Starting on one side, fold the dough towards the middle. Continue until till all the sides are folded over. (See the first five photos below.) Again, this video shows the method so much better than words can explain. 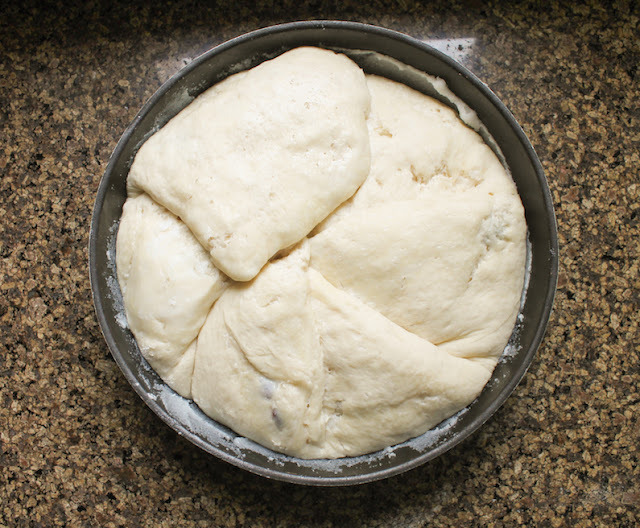 Let the dough rest for a few minutes, then roll it out again to a 15 in or 38cm circle. Spoon the other half of the lard mixture over the dough circle. (Photo 6 above) Spread it with the rubber spatula. Now sprinkle on the cranberries. Repeat the folding process till all of the sides have been folded in again. Place the dough in the prepared pan. 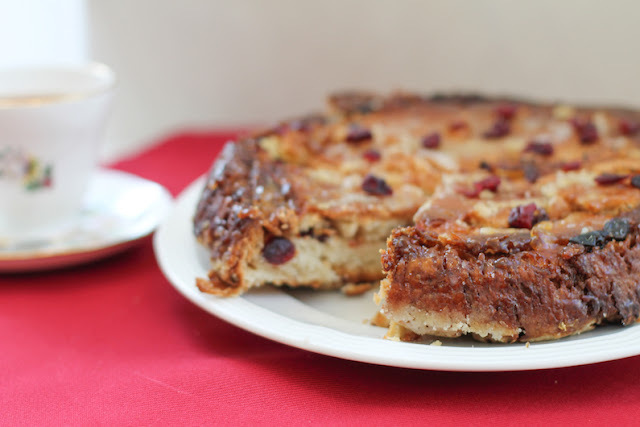 Cover loosely with cling film and leave the cranberry lardy cake to rest and rise for two hours. It doesn’t really rise very high but it does fill the pan. When your two hours are almost up, preheat your oven to 375°F or 190°C. Bake the lardy cake for 45 minutes, covering the top with foil if it starts to get too brown. Remove the pan from the oven and leave to cool for just a few minutes. Leave it any longer and you may find that the caramel will stick to your pan, even it it’s nonstick. If this happens to you, use a blunt knife to ease it off the pan so the whole cake will come out in one piece. 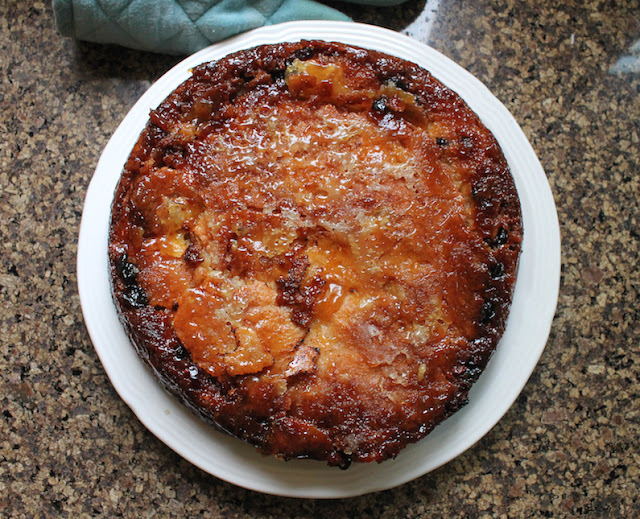 If necessary, return any pieces that stayed in the pan to the top of the cake. Or just eat them. I cannot tell you how wonderful this crunchy caramel is! 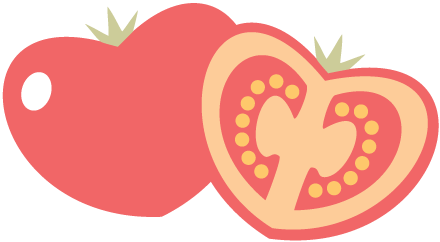 It's the perfect topping for the yeast cake underneath. Sprinkle with tablespoon or two dried cranberries to decorate, if desired. Enjoy!